Before the season started, Dayton and Rhode Island were projected to finish in 1st and 2nd place in the Atlantic 10 Conference. Dayton has held up its end of the bargain, heading into tonight’s game alone atop the A-10 standings. Unfortunately for Rhode Island, their star player E.C. Matthews tore his ACL in their first game of the year. This crushed the Rams hopes of contending for a regular season conference championship. While this matchup did not turn out to be the hoped for #1 vs. #2, it definitely did not disappoint. Early in the game, Dayton managed to jump out to a 16-8 lead largely due to shooting around 60% for much of the first half. As we would soon find out though, Rhode Island refused to go away and quickly turned the eight point deficit into a two point lead. For the rest of the first half, the teams went back and forth trading baskets. At halftime, Dayton managed to hold a 37-33 lead in what was shaping up to be an excellent ball game. Once again, a few minutes into the second half, Dayton built themselves a nice eight point lead going up 48-40. Just when it looked like the Flyers might finish off Rhody and put the game out of reach, the Rams came storming back. With 3:22 to go, Rhode Island drained a huge three to break the tie and grab a 61-58 lead. At this point, the entire arena was rocking. Ram fans believed their team might just pull off the upset on their first “Fear the Mask” night. Archie Miller quickly called a timeout to rally his troops. Though I was not in the Dayton huddle, I would imagine not much had to be said. The Flyers core has found themselves in plenty of these types of situations over the years. In fact, they just finished one on Tuesday night when they managed to comeback against Duquesne and escape with a win. With 55 seconds to go, down one, Dayton’s always reliable Dyshawn Pierre drew a foul and sank both free throws to put Dayton back on top. Rhode Island, however, immediately turned around and got a bucket of its own. Hassan Martin converted an and one to give his team a two point lead with 40 seconds left. As it ended up, however, the most clutch play of the game was yet to come. Scoochie Smith drove to the hoop, but instead of taking a tough shot around the rim, he decided to kick out to Dyshawn Pierre. Pierre instantly passed the ball to sophomore guard Darrell Davis in the corner who nailed a three giving the Flyers the lead with 17.9 ticks remaining. After Four McGlynn, who had been money all night for the Rams, missed a jumper, Steve McElvene grabbed the rebound for Dayton. Rhode Island fouled him, but with only 0.3 seconds left it would not matter. 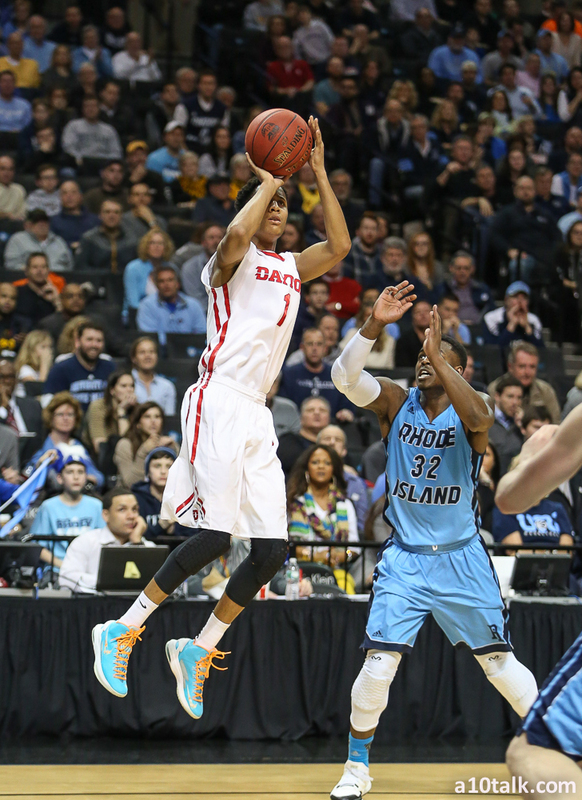 Dayton held on for the tough 68-66 road win against Rhode Island. With Kendall Pollard sidelined due to a knee injury, senior leader Dyshawn Pierre stepped up for the Flyers. He led the Dayton attack with a near double-double of 17 points and 9 rebounds. Scoochie Smith also played a big role in the Flyer’s win. His penetration was a major key as he put up 13 points. Charles Cooke had a near double-double too with 8 points and 9 rebounds. Last, but certainly not least, Darrell Davis contributed 11 points including his game winning three. Even though Rhode Island had four players score at least 13 points or more, they were not able to come away with the win against Dayton. Four McGlynn and Hassan Martin presented huge challenges for the Flyers all night. McGlynn had a game high 19 points while Martin recorded a double-double with 15 points and 10 rebounds. The foreseeable future will not get any easier for Rhode Island as they travel to VCU on Tuesday. Dayton stays on the road for a big game Wednesday against, currently tied for 2nd in the A-10, St. Joseph’s.